As one of the leading suppliers of Continuous Electromagnetic Induction Capper from Delhi, we are continuously meeting the client's requirements for many years now. This machine is well appreciated for its durability, low energy consumption, and sealing speed of 2 -12m/min. Also, it light weight (38 kg) and easy to install along with the added benefit of low maintenance cost. We have good stature in the market regarding our quality Continuous Electromagnetic Induction capping machine. The thing which makes us different from he other companies is our reliable services, which we provide after the sale of product. Its operation is based on electromagnetic induction principle of producing instant high heat, which is used to melt aluminum foil. This ultimately helps in realization of the end aim, which is to keep the freshness in and increase the preservation time. 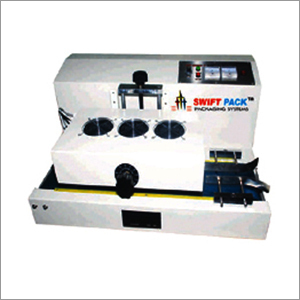 This capper or capping equipment is ideal for use on different bottle types and cap sizes.